Pull up your preferred search engine and type in ‘the best gaming monitor’ and you’ll be bombarded with an assortment of advertisements for sales, expensive monitors with the latest (but ultimately useless) features such as extra USB ports, etc… Really, who’s looking for a top quality gaming monitor and doesn’t have an equally nice case with plenty of USB 2 and 3? Sure the little extra features can be nice to have just in case, but they aren’t what you should be basing your purchase on. Picking out a top-notch gaming monitor takes a bit of research and time. After all, there’s a lot to consider. 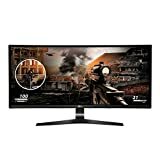 Gamer’s typically find that their monitor needs are quite different from the other computer enthusiast’s. If you’re like most gamers, you’ve got a few hundred to a few thousand invested in your case components already. But even if you’ve built the best gaming PC, it isn’t enough without a monitor. A subpart gaming monitor makes all of this fancy tech practically useless. If the screen can’t keep up with the processors, refresh rate, etc… then your experience will be severely limited. We’ve put together this guide to help you navigate your way through the sea of seemingly endless monitor models. So if you’re ready to jump straight into a list of the absolute best gaming monitors available right now, read on! We’ll even explain the differences in features so that you can decide which one is the perfect monitor for you! What To Consider When Choosing The Best Gaming Monitor? It’s a common misconception that when it comes to gaming, bigger means better. This isn’t necessarily true, however. A large monitor without the appropriate specs to run heavy duty game software will be a huge disappointment for gamers. This situation typically results in flickering, ghosting, graphic tears, etc… It is important to check out each of the following specs and features before making your purchase. This will ensure that you get the most out of your gaming monitor, for years to come! 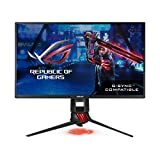 Gaming monitors between 19 inches and 24 inches are considered the sweet spot for gaming. That doesn’t necessarily mean that a larger monitor won’t work well. Part of the problem in choosing a size is technical, but it’s also a matter of personal preference. A lot of gamers make the mistake of going as big as they can afford to, however; thinking that it will create a more immersive experience. Rather, it can make it difficult to keep track of motion along the screen sides (such as enemy flanking) and can cause a host of other complications such as flickering or resolution problems. Consider how much power your system itself has before buying a new monitor. This is the best way to gauge whether or not your new gaming monitor will work optimally with the rest of your gear. When it comes to resolution considerations, you can always count on it that monitors with higher resolution (or higher density of pixels on the screen display) will provide you with higher definition. Assuming that you have the right PC gear to run it. Don’t be fooled into thinking that anything labeled High Definition will get the job done. High Definition offers a pixel count of 1920 x 1080 (aka 1080p). The number of pixels does not change based upon the increase or decrease of screen size. They simply become smaller/larger as appropriate to fit. So smaller HD screens provide greater clarity than larger ones. However, if you’re interested in the 25”+ size gaming monitors you can always go with QHD which offers a pixel count of 2560 x 1440 (aka 1440p). Most gamers prefer to stick with the QHD resolution, even for monitors smaller than 25” because of the depth of detail that it provides. There are other forms of HD available as well, such as UHD which provides 3840 x 2160 pixels. While 4K UHD, QHD, WQHD, etc. 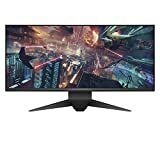 are less common amongst computer monitors, they are becoming increasingly easier to find. These display resolutions are fantastic for larger monitors, so long as you ensure that your PC itself is powerful enough to handle the task. To learn more on how to decode HD-speak, check out this great guide on the differences. Choosing between an LED and an LCD monitor is mainly a matter of user preference. It basically boils down to a matter of the difference in color quality, and the range of contrast. Most gamers prefer an LED; but if you’re on a budget an LCD can still definitely get the job done. There are a surprising number of technologies that go into LCD panels, which you can read more about here. If you predominantly play colorful, vibrant games on your PC, an LCD will do the job nicely, in fact. However, if you play a wide range of games with varying contrast and color temperatures, you’ll be much happier with an LED. What’s the actual difference? Not much. An LED monitor is an LCD with additional backlighting. When you’re playing a dark palette game with high density shadows, shading, etc. however, this small difference can mean a lot. You’re jamming through your favorite platformer, everything is going according to plan – and suddenly you’re dead. And you have no idea what happened. Sound familiar? This is what happens when your monitor doesn’t have a fast enough response rate. The time that it took to render the images of your attackers was greater than the amount of time that it took them to kill you. There practically is no greater frustration in gaming. Avoid tech rage by checking the response rate of the monitor your considering, before you buy. Ideally, you want a range of 5 milliseconds or less; with 1 millisecond being the best. Although they are frequently confused with response rates, refresh rates are completely different. The refresh rate is the rate at which frames update while you are playing. While you won’t ‘lose’ any time in the game if your frame rates are low, you will likely experience graphic tears. You’ve probably seen this before on a standard 60Hz monitor. The graphics appear to have rifts; or missing sections. As a result, graphics appear in ‘chunks’. For gaming, you’ll want to avoid 60Hz completely. Consider something in the 120Hz or 144Hz range (or higher) instead. The ASUS ROG Strix XG258Q offers flexible connectivity options with DisplayPort, HDMI 2.0 and HDMI 1.4. The Adaptive Sync/FreeSync capacity ensures smooth gameplay by eliminating screen tearing and stuttering. Additionally, ASUS Eye Care technology makes marathons even easier, reducing eyestrain and other visual problems with TUV Rheinland-certified blue light filter and flicker-free backlighting. Game-grade ergonomics such as tilt, pivot, swivel and height adjustments allow you to play like a pro in your comfort zone, no matter how you prefer to game. Despite the mid-to-low range price, this monitor behaves like one of the top guns. You’re sure to be blown away by the crisp, clean imagery and the adjustable viewing settings. With easy to navigate menus, you can adjust your backlights, screen views, and much more with ease. Boost your gaming experience together with Acer Predator X27. Its top-notch 99% Adobe RGB color space with IPS technology guarantees vivid colors while nanosized dots make the images always look lifelike. Besides, as there are up to 1000 nits of brightness, you will be able to enjoy a bright and detailed picture even on the sunniest days of the year. This gaming monitor comes with jaw-dropping specs such as IPS panel with 144Hz refresh rate and a response time of 4ms. Thanks to this all images will save every detail and you won’t face such unpleasant phenomenon as ghosting even in fast-moving scenes. Note that this 27-inch widescreen IPS display comes with NVIDIA G-SYNC Technology. What is more, its contrast ratio is greatly improved by the FALD. ASUS VG279Q is a great money-saving decision. It’s much cheaper than Acer Predator X27 but its quality level and range of options won’t leave you indifferent. This 27-inch gaming monitor comes with Full HD and ultra-fast 1ms response time. 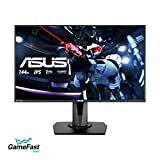 Due to 144Hz refresh rate and ASUS Extreme Low Motion Blur (ELMB) Technology fast-moving objects look sharper and the image is always smooth and detailed. Note that this Asus IPS display is designed with Fast input technology to improve users’ gaming experience. Its exclusive GameVisual and GamePlus functions boost color performance and control during gaming as well. Shadow Boost makes the image more accurate and detailed, especially in dark areas. ASUS VG279Q is also provided with Adaptive-Sync (FreeSync) technology to minimize screen tearing and choppy frame rates. By the way, this monitor takes care of its users’ health as there is ASUS Eye Care technology which is aimed to reduce eye fatigue. It also comes with an ergonomic stand as well as all types of adjustments to accommodate any desk. Need ultra-fast monitor with detailed and sharp image? Have a look at ViewSonic XG2760. Its outstanding 165Hz refresh rate with improved ULMB (Ultra Low Motion Blur) technology will take care of fast and accurate performance. Besides, this monitor comes with NVIDIA’s G-SYNC Technology, which synchronizes the frame rate output between the graphics card and monitor. Another great feature is 1ms response rate, which means that you will forget about screen stuttering, blurring, or ghosting. 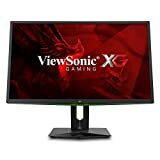 ViewSonic XG2760 is not only highly responsive and quick. Its special Game Mode includes optimization for FPS, RTS and MOBA. Add to this black stabilization function for enhanced visibility and better targeting, and you will get one of the best gaming monitors to choose from. Note that there is also an ergonomic stand designed for gaming needs. It comes with an integrated headphone hook and cable management functionality. You can easily adjust the monitor to your desk regulating its height and general position. By the way, ViewSonic XG2760 comes with DisplayPort and HDMI inputs using which you can connect to the graphics card or gaming console. There is also Game Mode hotkey which presupposes a great combination of color and technology designed namely for gaming needs. Immerse yourself in a 35″ screen and 3440×1440 resolution with 1800R curvature, for panoramic entertainment with the BenQ EX3501R gaming monitor. With its High Dynamic Range technology, the monitor offers greater brightness and contrast level, bringing an incredibly detailed image performance. Despite the high price tag, this gaming monitor is worth the buy. Using USB-C, you can enable SuperSpeed USB data transfer and 2K video delivery over a single cable, which is incredibly convenient for those who will use their monitors for work as well as gaming. The height and tilt adjustments along with Brightness Intelligence Plus Technology provide supreme and ergonomic viewing comfort. The AMD Free Sync empowers intensely smooth gameplay while eliminating choppy tearing and broken frames to keep your view unblemished. The BenQ has the technology to determine the ambient light you’re working in and adjusts the brightness accordingly to stave off unnecessary eye strain. 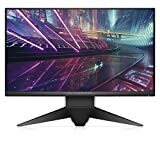 Dell’s Alienware AW3418DW gaming monitor offers a unique 34″ curved design with super high 21:9 ratio and 1900 Radius, which maximizes your field of view. The new AW3418DW provides the ultimate gaming immersion. With its fast 120Hz refresh rate when overclocked combined with 4 millisecond response time, it delivers buttery-smooth gameplay. This breakthrough display technology eliminates screen tearing and minimizes display stutter and input lag to deliver the smoothest, fastest, most breathtaking gaming experience with a serious competitive edge. Customizable AlienFX with 4 different lighting zones provides an amazingly personalized, dynamic look to make your monitor reflect your style and deliver deeper immersion in the game. Your gaming experience never looked better than when viewed on the Alienware AW3418DW gaming monitor. With the curvature and crisp, clean view, you will not regret making this purchase. 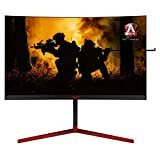 Another great monitor for gaming is AOC Agon. Thanks to its unique design with 1800R curvature your gaming experience will be brought to the new level. Its refresh rate, as well as NVIDIA G-SYNC technology, provide accurate image and smooth graphics, so you will forget about screen tearing and display stuttering. This gaming monitor also comes with UltraWide QHD resolution of 3440 x 1440 pixels for a detailed picture. There are some great display settings to make the game even more enjoyable. One of them is AOC Shadow Control using which you can add more light to the darkest areas of the image or you can make the light parts darker. Note that the rest of the screen won’t be affected by such kind of changes. AOC Agon has also got an ergonomic and adjustable design as it’s equipped with a retractable headset holder. In order to find the most comfortable position, you can change the monitor’s height. Its AOC Ergo Base ergonomic stand also allows tilting and swiveling. What is more, you can change the monitor’s look thanks to the customizable colored LED lights. 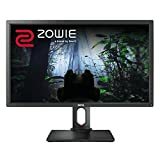 One of the best budget monitors for gaming is BenQ ZOWIE. Except for its reasonable price it also comes with a fast response rate of 1ms. This RL series is designed with ultra-low input lag technology, which brings gaming experience to the new level. As a result, BenQ ZOWIE means no ghosting or smearing. Darkness is one of the factors which can turn the whole gaming process upside down. Thus, not to become a loser in a minute BenQ ZOWIE provides its users with Black eQualizer color engine technology. It allows you to add some light to the dark scenes when you need it and save all the necessary details which may play a crucial role. This gaming monitor reduces flickering at all brightness levels what helps to fight with eye strain. It means that BenQ ZOWIE can be used for long hours of gaming. Note that the monitor is equipped with two HDMI ports and includes optimal color calibration settings. There is also height adjustable stand for comfortable use and smart scaling and display mode which allows simulating custom screen sizes. The Samsung CHG90 QLED gaming monitor’s behemoth 49-inch monitor with super ultra-wide screen and innovative 32:9 aspect ratio is bound to blow you away. The Samsung QLED delivers purer, brighter, and more lifelike colors with its High Dynamic Range (HDR) technology. A maximum power consumption of 113 Watts is unexpectedly low for a monitor of this size and with this power. You can be sure to enjoy a smoother gameplay with ultra-fast 144hz refresh rate while enjoying the stability of the durable and sturdy HAS stand, this monitor was designed for gamers with multiple game modes. The motion blur reduction and VA panel let you enjoy unprecedented gaming performance without motion blur across the entire screen. Designed for the gaming and video watching enthusiasts of the world, Dell’s Alienware 25 AW2518H delivers a unique futuristic style and precise form with solid stability feel. You will undoubtedly see gaming differently with the extraordinary NVIDIA G-SYNC. This breakthrough display technology eliminates screen tearing and minimizes display stutter and input lag. The lightning-fast 240Hz native refresh rate combined with 1 millisecond response time delivers buttery-smooth gameplay with virtually no input lag. Specific gaming OSD (onscreen display) design keeps your user experience in the gaming theme. Play comfortably in your zone with a height adjustable stand, tilt, swivel and pivot features. Built with premium materials in a thin, easy-to-adjust design, the 25″ gaming monitor stays true to the expert Alienware engineering gamers have come to expect. Find your ideal viewing position with tilt, pivot, swivel and height adjustable features, and settle in comfortably for those marathon gaming sessions. Agon AG273QCG is another great gaming monitor from AOC. It also comes with a curved panel to boost the total immersion and provides you with wide-viewing angles. Its design can be easily customized according to your needs. This AOC Agon monitor has got an ergonomic dial height adjustable stand which can be tilted and rotated to reach the most comfortable position. Besides, there are built-in speakers and a headphone hanger. Due to this you can easily choose the best line of sight to make gameplay a pleasant experience and prevent eye fatigue. This 27-inch gaming monitor from AOC is also designed with adjustable LED lighting and several gaming modes. Thus, you can create the most comfortable conditions for game playing taking into account your personal needs and preferences. By the way, there is HDMI 1.4 and DisplayPort 1.2 inputs which come with USB 3.0 hub. Being certified for VESA DisplayHDR 400 this monitor provides excellent brightness level as well as lifelike colors. What is more, 165Hz of refresh rate and 1ms of response time make its performance fast but at the same time smooth. Thanks to G-SYNC there is reduced screen tearing and stutter. You can also control the brightness level of dark areas as AOC Agon AG273QCG comes with Shadow Control. Another great monitor for gaming is MSI Optix MAG271C. Its curved 1800R display provides good gameplay immersion and reduces eye strain. The anti-flicker technology eliminates a flicker-rate and guarantees smooth picture. Add to this AMD FreeSync technology and you will get one of the best images a budget monitor can produce. It refreshes rate to AMD GPU what results in less screen stuttering as well as tearing. Note that to use this technology your PC must have a compatible AMD GPU. MSI Optix MAG271C is also fast as it comes with 144Hz refresh rate and 1ms of response time. Together with VA LED panel all this will let you enjoy the fast-moving game genres and always stay one step ahead of your enemy. LG’s 34UC79G-B gaming monitor offers a 21:9 aspect ratio curved UltraWide FHD IPS display with a 144Hz refresh rate, delivering fluid gameplay and dynamic field of view which is ideal for non-stop immersive gaming. Utilizing AMD FreeSync, gamers can experience seamless, fluid movement throughout hi-res, fast-paced games or movie frames. 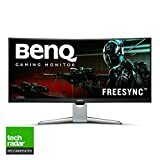 FreeSync nearly eliminates tearing and stuttering that can occur because of differences between a graphics card’s frame rate and a monitor’s refresh rate. With the Crosshair feature, gamers can easily continue taking their skills to the next level. By placing the striking point in the center of the display, the feature enhances firing accuracy in first-person shooter games. You can quickly and seamlessly optimize monitor settings to activate Black Stabilizer to reveal superior detail in dark scenes while the Dynamic Action Sync feature assures smooth, fluid gaming action. With a 144Hz refresh rate, games played on the LG 34UC79G are noticeably smoother when compared to monitors with refresh rates of 60Hz or 75Hz. Combine the smooth action with the curved IPS screen, and gamers will love the optimized and immersive gaming experience very nearly any viewing angle. At just over $200, the Acer XFA240 sports a 24-inch widescreen TN display with the absolute latest AMD FreeSync tech. This goes hand in hand with the 144Hz refresh rate and response time of 1 millisecond to give users a truly excellent gaming experience. This Full HD (1920 x 1080 pixels) gaming monitor is perfect for serious gamers on a budget. Really, we can’t rave enough about how great of a deal this is. Want to connect with multiple device types? No problem. This monitor is equipped with input ports for (v1.2) display port, HDMI, MHL, and DVI, so that you can connect with pretty much anything you please. Whether you are on a budget or have all of the money in the world to blow, it is simple to find the right elements to put together a top-notch system that works for you. You just have to look in the right place! While you’re in the market for a new gaming monitor, you might also consider checking out our lists of the best gaming mouse selection; as well as our list which covers top gaming keyboards currently available. These additional purchases are incredibly cheap in comparison to the purchase you’re already considering, and will exponentially amplify your gaming experience!